You may have noticed that I've been quiet of late. Then again, there's been so much going on in the beery world that I think that's very unlikely. It was fantastic to meet so many fellow bloggers at EBBC in Leeds back in May. A conference like no other, where the emphasis was firmly on inclusiveness, ethics and let's be honest, having a damn good time. I was also thrilled to be able to visit two of the rising stars of the UK's exciting craft brewing scene during the weekend - Summer Wine and Magic Rock (blog posts will follow!). As if that wasn't enough, I'd also like to post about IPA Day and GBBF. This will all have to play second fiddle to the wedding planning though - only 6 weeks to go! I'll leave you with a graph (of course) knocked up to respond to a post on twitter. Completely out of kilter with the rest of this blog post but I think the colours of the Abstrakt labels look nice together and may brighten it up a bit. 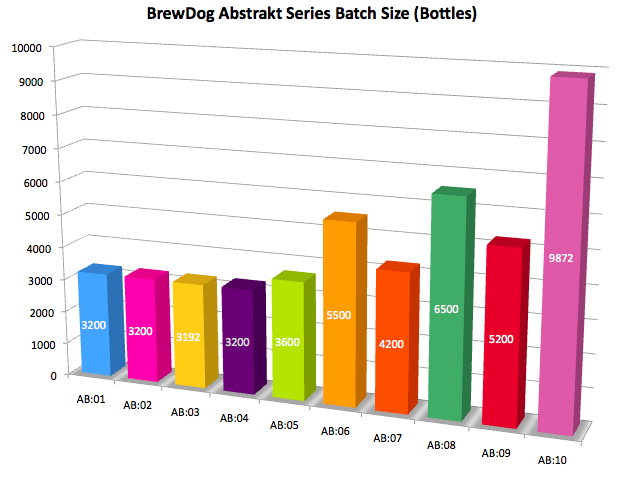 My only observation is that this somewhat resembles BrewDog's growth in terms of revenue. I wonder what happened to the couple of litres of AB:03 that prevented it being a nice round 3200 bottles. Maybe they fell into Bracken's bowl.